Elias is in the ring. After playing his guitar, Elias claims to be WWE’s most valuable asset. He also says he will become the Intercontinental champ at Money in the Bank. He talks about hitting Seth Rollins with a guitar last week and says he took the pain from losing one of his favorite guitars to write a new song. Then he plays that song. Rollins interrupts and heads towards the ring. He grabs a chair before entering the ring. He and Elias have a standoff before Rollins hits the guitar out of Elias’ hands. Before Rollins can attack Elias though, Jinder Mahal and Sunil Singh attack Rollins from behind. After a few seconds, Roman Reigns runs to the ring to help Rollins. Kurt Angle comes out the stage to announce a tag match. Which starts now. Good match. I think this was a good preview for Elias versus Rollins at Money in the Bank. Their interactions were definitely the best in this match. Bruce Prichard is in the front row. In the ring, Curt Hawkins is at 199 losses in a row, but he won’t hit 200 tonight. And when he wins, everyone will get a free taco. He calls over his opponent for tonight, James Hardin, and thanks him for being a part of history. This was silly and just an excuse for Baron Corbin to ruin things for Hawkins. It was nice seeing Hawkins on RAW though. After the match, Baron Corbin dumps a table of tacos over onto Curt Hawkins. Natalya gets punching advice from Ronda Rousey. Baron Corbin tells Kurt Angle that he went to Stephanie McMahon, and she named him Constable of RAW. Angle is frustrated. Pretty good match. Natalya had some decent moments, but this was all about making Nia Jax look strong. I understand that they’re building up a friendship between Natalya and Rousey, but I think it’s strange seeing Natalya hurt pretty much every time they’re together. She’s a former champ, but she seems fragile ever since Rousey has shown up. Natalya struggles with her hurt knee after the match. Nia Jax looks on and seems to want to help, but Ronda Rousey tells her to back off. Rousey helps Natalya walk to the back. Bobby Roode tells Renee Young that he is ecstatic about being in his first Money in the Bank match. He can’t wait to be a glorious Universal champ. But tonight, he has to face Braun Strowman. His goal for the match: just to survive. This was mostly just an exhibition for Strowman. Roode ran away a lot and Strowman broke a ladder. This was alright buildup for Money in the Bank, but it wasn’t much of a match. Nia Jax apologizes to Natalya, but Ronda Rousey tells Jax to leave. Natalya decides that she needs some time for herself. Renee Young welcomes Matt Hardy and Bray Wyatt to the ring. Wyatt says that any team who faces them will be facing woken warriors, fireflies, and gods. Hardy says his and Wyatt’s essences have traveled through space and time to become the RAW Tag Champs, and they are unstoppable. Whoever wins tonight’s number one contender match will suffer and be deleted. This wasn’t very surprising. The first elimination was interesting, but other than that, this was a quick battle royal with quick eliminations that didn’t really deviate from the obvious course one particular team is set on. Bobby Lashley heads to the ring and invites Sami Zayn to join him. Instead of heading to the ring, Zayn talks to Lashley while standing in the crowd. Zayn says he’s been on Instagram this past week, and he decides to share some of the posts Lashley has made. Zayn mocks Lashley’s “inspirational” posts and says that Lashley is a narcissist. Lashley doesn’t know whether to laugh at or to feel sorry for Zayn. Zayn says everything about Lashley is a lie. When he asks if Lashley was even in the army, Lashley finally stops smiling. Charly Caruso welcomes Jinder Mahal and Sunil Singh. Mahal says Reigns feels threatened by Mahal’s superiority. Reigns has been given multiple opportunities which should have been given to Mahal. Soon, Reigns will find that a storm is coming. Elsewhere backstage, Renee Young holds a mic for Roman Reigns. Reigns wonders what Mahal has done lately. Mahal takes offense and tells Reigns to say what he has to say to his face. Reigns says he will, and he goes off in search of Mahal. They find each other, and a brawl breaks out. Adam Pearce and some referees pull Reigns off of Mahal to break up the fight. This was pretty good, but the finish was kind of silly. Alexa Bliss left the match early after (most likely) faking an injury, so the Riott Squad was able to dominate. Sarah Logan was well on her way to ending the match when Bayley ran down to the ring and inserted herself, apparently legally, into the match. Clearly this was done to further some story lines, but it was still silly. Baron Corbin gives Kurt Angle grief about what happened in the last match. Corbin tells Angle to go inform Sasha, Ember, and Bayley that their win doesn’t count. Or does Angle want to talk to Stephanie? Ember, Sasha, and Bayley celebrate their victory. Sasha thanks Bayley, and Ember wants them to hug it out. Before they do, Angle walks up and informs them that The Riott Squad won by disqualification since Bayley wasn’t even in the match. Baron Corbin questions John Cone over his decision in the previous tag match. Big Show welcomes Team Texas for the Special Olympics USA Games. Good match. Even though this match didn’t really mean anything (with its lack of meaning highlighted by its non-finish), I liked the fight between these two. I think if something were on the line, these two guys could have a really great match against each other. Owens continues his attack by hitting Balor with a frog splash. Owens then brings a ladder into the ring, Owens thinks about hitting a splash from the ladder, but he has second thoughts. 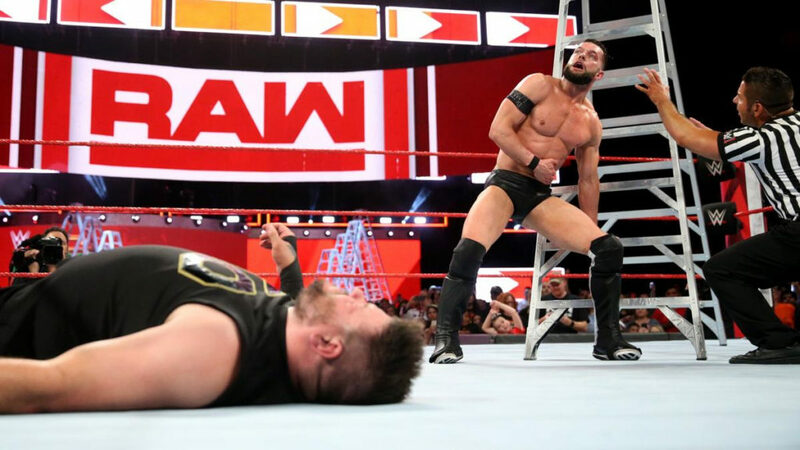 Balor recovers and pulls Owens from the ladder. Balor hits a Coup de Grace from the ladder, then he climbs up and takes the Money in the Bank briefcase. This show was alright. It took me a while to get through (I watched it on delay), but it was fine. I’m still not very interested in certain stories (Reigns/Mahal and the tag titles), but the show could be worse. A good match that didn’t mean much on a night that didn’t mean much in the long run.